Opening this month's Wine Focus on rosé wines, I try red and pink Cabernet Sauvignons side-by-side. Just for fun, we compare and contrast a favorite Napa Cabernet Sauvignon (Rocca Family Vineyards 2003 Yountville Napa Valley Cabernet Sauvignon, $55) and a very fine South African pink Cabernet (Mulderbosch 2006 Stellenbosch Cabernet Sauvignon Rosé, $13). I had expected to be in Burgundy this week. As it turns out, I'm home, gradually getting over a sneak attack by a summer virus that unceremoniously changed my plans. That's why today's 30 Second Wine Advisor comes to you a day late and in abbreviated form. I'll continue my original plan to have no Wednesday or Friday Wine Advisor or Thursday FoodLetter, this week. We'll get back to normal next week, I hope! As we move into July and the peak of hot summer weather, a lot of wine enthusiasts are turning to rosé wines as a refreshing way to beat the heat. I can't say that I'm entirely opposed to this maneuver ... I've enjoyed some memorable pink-wine experiences, most often while dining alfresco in Provence and enjoying the food and wine of the country amid balmy summer breezes. Still, by and large, when I'm pulling the cork (or unscrewing the cap) from a bottle of rosé, I find myself instinctively wishing that I had just gone ahead and opened a red. Can I be trained out of this prejudice? I'm willing to try. As we often do in summer time, we're devoting this month's Wine Focus on our online WineLovers Discussion Groups to pink wines in all their forms: Still and sparkling, bone-dry, off-dry or sweet. As I reported in a dissertation on this topic last summer, true rosé wines are distinguished from "blush" wines by their relative dryness and tart acidic structure. Perhaps even more significantly, there's considerable diversity even within the rosé category. Rosé wines may vary from off-dry to bone-dry, totally sugar-free; from feather-light to full-bodied; from soft, low-level acidity to piercing steeliness; from simple fruit to complex swirls of fruit, herbs and minerals; and, not least, depending on how the wine maker has handled the "blanc de noirs" process of extracting light-colored wine from dark-colored grapes, rosé wines may range from the palest pink through rose, salmon and copper to a rich claret color that's all but indistinguishable from red wine. To set the stage, I recently tried a just-for-fun tasting in which I opened a decent rosé wine made from Cabernet Sauvignon and a big, bold and young Napa Cabernet Sauvignon with the idea of tasting them side-by-side. And just to make things even more interesting, I served them with a rare rib-eye steak, sizzling from the charcoal grill. This natural match was bound to sing with the red wine ... but how would it work with a much lighter pink? The pink wine was a young, bold 2006 Rosé of Cabernet Sauvignon from Mulderbosch, a respected producer (better known for its white wines) in Stellenbosch, South Africa. 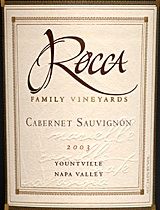 The red was a personal favorite from Napa, the 2003 Yountville Cabernet Sauvignon (with a splash of Merlot) from Rocca Family Vineyards. It wasn't really a competition - the styles of the wines are too utterly different. But it was still fun and educational to compare and contrast the two wines side by side, and to discover a subtle element of "Cabernet-ness" - a whiff of blackcurrant, a hint of fresh herbs - that pegged the wines as distant cousins, if not siblings, in the varietal department. The full, hearty, black fruit and bitter chocolate flavors of the Napa Cabernet made it a natural with the steak, just as I knew it would. The rosé with steak? Meh. The wine and food didn't actively fight with each other, but the wine served more to wash down the meat than to complement it. FOOD MATCH: Tasted as an experiment with red Cabernet's natural red-meat companion, a rare, char-grilled steak, the meat is really a bit much for the wine, which washes down the dinner but doesn't really sing in harmony. Next time I'll try it with a more appropriate rosé match: ahi tuna, Salade Nicoise or ratatouille. FOOD MATCH: A classic match with steak, specifically a locally produced, grass-fed rib eye char-grilled medium-rare.